So, it's now been a few days since I have seen my new client. Yesterday was my shopping day. I found many pieces that I can incorporate into my design. My biggest dilemma has been selecting the accent color for her space. She loves all colors, happy colors. I typically ask my clients what colors they dislike, then create a palette from what's left. Why do I ask what colors you dislike? So often you ask a client what colors they like. They don't often know. They will list two or three colors but neglect to mention others because they just don't realize how much they like them. Usually they own several articles of clothing in these other colors but have never considered them for their walls of home decor. It's often difficult to expand a personal view of something you feel you just "know". This usually requires expanding that perception by seeing a color scheme with those colors to agree. One thing you always know, however, is the one or two colors you hate! You have strong feelings about them and can recite them quickly. Think about it... You can see a cute pair of shoes in the store but pass them over because you don't like red. You can look through your whole closet and not find one green outfit. You can proclaim to the mountains that you can't stand yellow. Your likes may be a bit wishy washy, but your dislikes are FIRM! Now, one of the most important aspects of this design plan is scale. It's one of the most important parts of any design plan but even more so with a smaller space. It's also the most under planned concept by homeowners and the one they get wrong the most. I would say that seventy percent of all homes I see have furniture that's way too large for the space and another twenty percent has furniture that's just too small. That only leaves ten percent who actually get it right. It's not entirely your fault. There is a bit of math and science to it all. That's part of why people hire professionals. You may love a piece of furniture but that doesn't mean it's the right sized piece to live in your home. I'll keep you posted. Today, I put it all together and meet with my client at 5 to present my ideas. Yesterday I got to meet my new client from CA. I arrived when she was still in the medst of paperwork to secure her new apartment. The leasing agent was nice enough to allow us to coduct our work first and she could come back to complete her lease package later. However, when we went to see her new apartment, we both agreed that the online floorplan was a bit deceiving and was way smaller than she had hoped for. So, it was a back and forth looking at a fw different spaces until she found the one she wants. Now, I have to admit that this situation is a bit unusual for me, as I got to play real estate agent again. I am glad I was there to assist her in her choice because I had a good grasp of what she was looking for and it is difficult for many to interpret an empty space. The other unusual factor for this job is the time frame. My client will be moving in by next Friday. Tomorrow is a holiday and I have several jobs I am attending to at the same time. Typically, when working with your designer, it will take a week or two to meet again with a finished design plan and presentation, then the work begins after the client has signed off and given the appropriate deposits for their purchases. In this case (again beyond my norm), I am completing a good majority of the work, if not all of it- IN ONE WEEK! I am only able to do this because of the current status of several of my jobs, because I have a good grasp of what I will be doing in her small space and because I am purchasing a very small amount of stock furnishings and accessories to make the space work. Here is her new floorplan. In meeting with my new client I learned a few things. 1. She's lovely and we get along very well. (This is crucial for establishing a designer/ client working relationship). 2. She trusts me completely and will defer to me on options for her space (Trust again, VERY IMPORTANT). 3. Her budget is $4,000. For the type of furnishings and the amount she needs, this is completely do-able. If this were a one bedroom home- a permanent space, this would be FAR TO SMALL a budget. If this were a home I would be procuring higher end furnishings that would become lasting pieces. My client is looking for a comfy, yet temporary space for now. If she likes AZ and decides to make this her permanent residence, she may move after she gets the lay of the land and is unsure if it will be to another apartment or if she'll buy a home. She works A LOT, but outside of work, will never be home. She is an active woman who enjoys fitness and fun activities. She will mainly be home to sleep. She has no family in the area, but at times would like to have her sister come visit from California. In this small space, she requested a futon, as opposed to a sofa bed, which can be cumbersome and difficult to operate in a small space. I will entertain this thought, but I am going towards a click clack sofa which will be easier to convert from sofa to bed, by a simple click up and flattening of the back. My client and I have an understanding of the type of furnishings she is seeking for her space. The level of quality at this price point is average. A designer usually does not work with this type of furnishings because the construction is not at the standards that we approve of and can't ensure the longevity of the piece. In this case, longevity is not a necessity. Nevertheless, in any case where I am weary about a selection or a client is choosing something beyond my recommendation, I have them sign a waiver of liability. This waiver holds me harmless if the item or selection has any problems beyond the coverage in the warranty or any issues that are beyond my control. Considering that we are using items below a quality that I would normally work with, she is comfortable with signing this waiver. My client has no color preferences. This is a rarity and also makes my job much easier and faster to achive her end result. THIS NEVER HAPPENS! She purchased 2 pieces of photo art that she would like to use in her home and she doesn't care where they go. They will be my inspiration to some extent. Happily enough, they are in muted sepia tones, which allows me to use any color to compliment the space. It's a Sunday and I don't normally work today but I have a few errands near a furniture store where I know I can get a great click clack for her space. Stay tuned for what I come up with in Part 3. Happy Memorial Day! 4. One of my favorite designers on TV is Candice Olson, for her beautiful work and dramatic flair. She is a well admired designer and rightfully so, but the lavish designs and high end fits and finishes she uses in her designs all come with a very large price tag. Many homeowners crave this look but just don't realize the massive expense of an entirely mosaic tiled mother of pearl wall or the $2,000 chandelier she placed in the center of that latest basement remodel! A majority of the furnishings she uses in her homes happen to be from her own line of furniture and accessories and, while excellent in quality, they are not cheap. I can tell you easily that most of her room designs begin at $40,000 and that does not include whatever she is making to design them, nor her crew. I am purely speaking of the wallpapers, lighting, wood flooring, cabinets, tile, windows, furniture and her great accessories. She designs well done spaces, but homeowners have NO idea what they cost... and they DO cost! 2. Design shows have sponsors. You may notice the same products repeatedly advertised in each commercial segment. Sponsors are a great thing for a TV show! They help pay for production of the show in return for promoting their brand and product. These products are then used within the homeowner's space. Most likely they got this product for free, but you will have to pay for it. A few of these on a show dramatically cut down what the room's total cost was- so the next time they tell you the whole room cost under $1,000, please know that floor they put in didn't cost $100 out of that budget, it was donated...Great advertising, but no savings there! image courtesy of www.myditi.comThat's it. It's happened... You've just watched an hour of television that has changed your life and empowered you to take on the role of DIYer extraordinaire! There's just one problem- REAL LIFE DESIGN IS ABSOLUTELY, POSITIVELY NOTHING LIKE WHAT YOU SEE ON TV, and it's quite frustrating for me and the tens of thousands of other designers who watch these shows to keep up with what they are showing you, the homeowner. So, here's the reality. It can take anywhere from 1-3 weeks to get your plan together, depending on how busy your designer is. I average between 1-2. They have to source all of your room's items from flooring to draperies to furnishings. Anything custom designed, takes more time to dream up, plan and draw for you. Now that you have a plan that your designer presented, you approved & made no changes to... Your designer still has to order everything and await their arrival. I think I've thoroughly explained this one... NO magic wand, NO three day project. Not gonna happen! I know, it sounds so stern and so potentially detrimental... but that's because it can be! Your kitchen is still the biggest selling feature of your home and one of the most expensive spaces to renovate. The choices you make in this room can dramatically affect your property value, and whether you are planning on selling next year or ten years from now, wouldn't you rather make changes that affect your home's value in a positive manner? Perhaps you'll seek a home equity loan, maybe you'll end up selling sooner than you realize, or just maybe you are making changes to beautify your space for yourself; there's a way to make smart remodeling choices in your kitchen, and that begins with educating yourself on what NOT to do! 1. Not adding hardware to your cabinets- On the West Coast, it's a very common thing for new homes to come with kitchen cabinets that do not have hardware. These cabinets are the standard cabinets you can buy anywhere and are actually made to accept knobs and pulls. They simply don't add them because they are a very subjective item. They can also cost anywhere from $2.00 for a basic knob to over $30.00 per ornate pull; but that doesn't mean you should skip them. It's always funny to me that people just get use to opening their cabinet doors and drawers by tugging them open on the tops and sides. 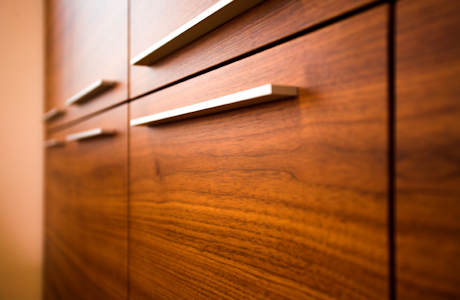 Wood is porous and although your cabinets have a finish, the stain is still susceptible to oils, which can slowly affect the finish over time. Knobs and pulls can add class or even change the look of your kitchen. Think of it like dressing up without wearing jewelry. Your look is just not complete without it, and neither are your cabinets. Imagine trying to open these drawers without a pull... Sheesh! My nails hurt just thinking about it! 2. White or Off White Appliances- I once heard a client several years ago say, "I like white appliances because they are clean"; as though other colors appear dirty. That's like the old thought that white paint in a room is cleaner than colors. It simply isn't true and in your kitchen, it creates a dated look. Kitchen appliances always go through a transitional phase of colors and styles. If these didn't change, we'd all still have sunny yellow or avocado green stoves. In the 80's and early 90's white, bone and biscuit appliances ruled the land and slowly behind it began a new revolution of black being the "in" color trend for those who chose to upgrade. One decade later began a new trend toward futuristic metals, which have now become a mainstay in the kitchen and black, still a nice choice, becoming the default. There is even a happy medium, with a price-point literally in the middle, of black and stainless steel combination appliances. As a designer, who continues to ensure that my clients optimize the value of their homes, I have never had a client who has said, "White appliances, yay! Let's keep them!" They are always the first things to go. When selling a home, they are an immediate value depreciator. I cannot stress this enough- stainless, stainless, stainless. It has become an appliance trend that knows no bounds, comfortable in a country kitchen, a Tuscan kitchen and a contemporary. It's a trend that will last for decades and a worthy investment for your space. 3. Making your backsplash look like an afterthought- It always boggles my mind when I see kitchen displays that show a really great tile backsplash... sitting on top of a 4" granite, quartz or solid surface backsplash. Why would you do that? Some will say that they didn't know you could remove the little counter splash, some are worried about the added expense to do so and some just think that's the way you do it. A backsplash is meant to be a seamless piece of decorative art behind your counter. (It also serves a menial little utilitarian function of waterproofing...lol) Your normal counter backsplash can and should be removed to install your new tile, going up the full 18" from the top of your counter, to the bottom of your wall cabinets. It looks clean, well thought out and adds value to your space. If you are already investing in upgrading your kitchen with tile, removing your old splash should cost you no more than an extra $50- $200 (depending on how much they must remove) and may slightly damage the wall behind your splash. If removed carefully, by scouring the old caulk and then lightly prying it off with the appropriate tools, it may leave little to no damage. If damage does occur, it takes nothing more than a light spackle and sand and then you are off to the races with a full tile splash. It seems like such a small oversight, but it really goes a long way to perfecting your clean, updated look. Do you see how this granite backsplash chops up the space? Look at the next picture. This homeowner did it dorrectly. The look is clean and your view is unbroken. 4. Granite or other tile countertops- Grout looks great on a backsplash, but is dreadful when you have to regularly wipe it down on a countertop. Granite has long been the star of the stage for counters, but granite tile is not the same as having a granite slab countertop. I've written about this several times and will continue to fight the good fight! Putting granite tile in your kitchen is like having a gold plated ring with a diamond setting- there's just no value in it. The value of the "gem" is lost in the cheapness of the product. Granite tile is made of discarded left over granite slab. That's not what devalues it. The fact that it has become tile, versus a continuous slab is where it loses it's appeal. The look is not as seamless nor attractive. The fact that you have to invest $2,000 to do a granite tile top is even worse. It's just because it's granite and required diamond blades to cut the tile and the product itself can average between $7.00- $20.00 a square foot in material. Granite throughout the years has lowered dramatically in price. There's an old adage that says, "If you're gonna do it, do it right!" This could not be truer when it comes to granite. Any tile installed as a countertop is a BAD choice for countertops because oil, grease and chemicals get into your grout, sealed or not and discolor it, darken it, desanitizes it and it requires maintenance that is not worth it. So, unless you live in a historic home where the old fashioned look of yesteryear needs to be preserved, please use a slab countertop on your cabinets. Anything else is a waste of money. cabinet either. You can have some gaps to help it look cleaner and well planned. Consider two things as well: 1. These should not be squished into place. Make sure your space isn't too close to the ceiling. If it is, it's really not adequate visually to add decor. 2. These items should be cleaned occasionally. Some people simply set em then forget em and end up with hairy ferns that seem to become mutant in appearance. The less you have above, the faster you can keep them clean and well cared for. By avoiding these five HUGE mistakes, you can work towards a more livable and valuable kitchen that you and others can enjoy! More sporadically placed decor shows cleaner than piling your space with clutter. Arizona is a veritable buffet of interior designers and decorators chomping at the bit to earn your business. That's the good thing. Now for the bad... In Arizona there is no skill required to obtain an interior design company, nor license. With SO, SO many of us around, how do you know you've found the right one to work with? That's a fantastic question. I will try to be as objective as I can with my answer, but of course, I will toot my own horn... toot, toot! Some interior "designers" in Arizona are nothing more than a well dressed decorator. Decorators can make your space pretty- they, well... DECORATE. They can't really go beyond that, having no techincal knowledge of what we do. You may think initially that your project may not require much more than this, but if you are looking for someone to propose the absolute best options for your space, that may require more knowledge than whether that color upholstery will match that color floor. I have been suprised to find that many designers in Arizona do not know wood species, their characteristics, understand fabric ratings, light planning, scale, many can't render a room to show you what you will be getting as an end result of their design, very few know plumbing or understand specifications and far fewer can interpret a blueprint. Working directly with remodelers, I've come across countless errors made by other designers in the field, stemming from a lack of knowledge. These are things that you just don't think of until there she is standing in your room after two weeks of working with her and all she's done is dressed up your pre-existing space without really seeing that the floorplan can possibly exist in a different way. A good way to judge if your designer is not much more than a decorator is by their hourly fee. It should be lower because they do not have the technical knowledge that would expect a higher salary. If your designer is charging less than $100.00 per hour, please know they are most likely not a designer. That being said, you can obtain a great designer for a rate of $125.00-$150.00 per hour, with many now offering value based flat fees ( I am one of them). Having done this for over seventeen years now, on the East and West Coast, I know this to be a very fair wage for what we do. If someone is charging you more, that does not mean they are better... and that brings me to my next topic. The more skill your designer possesses, the less outsourcing they will need to do to complete your project. For instance, I am an interior designer who also specializes in kitchen and bathroom remodeling. I can fully design a kitchen or bathroom, right down to the cabinet layout and fixtures that will work best within the space, doing my own technical drawings usable by a contractor. I can ensure that the fixtures will fit properly, understand the construction required to move a drain or cutouts needed when putting a certain style of faucet in a vanity that contains all drawers (I just recently saw this huge mistake made by a very well known Scottsdale design firm). Working with a designer that has this kind of knowledge can only benefit you and your project by having less hands on the work and greater project management. I also have a fantastic team that I work with constantly, consisting of my own custom cabinet and remodeling shop- owned by my husband, Jay Dunbar of J&M Custom Millwork & Remodeling, and an amazing custom home and commercial builder, Kevin Panoski of Kevron Homes. Some designers have to outsource this type of work, and that's ok, but that typically means there are added costs involved, as each time a plan passes hands, there is profit thrown on top of that next source's cost. Lastly, use good judgement when selecting your designer. Do you feel, after meeting with them that they will be a good fit for you and your project? Have you seen their work? An experienced interior designer will have photos of their work and references of past clients. Be leery of someone who shows you nothing but one photo of each project they've done. Sometimes one photo is all that's required to show off the work, but designers know how important the process is from beginning to end, so your designer would be able to show you a few before and afters or even mid project construction photos. This is how you will know that this work is truly their own. I only bring this up because I have been shocked to find that a few designers in AZ have comprised websites and portfolio photos of work that is not even theirs. I also know of one designer who's website shows you nothing but inspiration photos stolen from another website. It's great to have inspiration, but this doesn't show you what they can accomplish for your space. I happen to be friends with a few designers both in Arizona and in New York who actually do great design work. There are a few good ones out there, in addition to myself, of course! One of my favorites, if you live in the New York area, is Meredith Zaretsky Weis. I highly recommend you contact her company, Merri Interiors, for all of your design projects. Like me, not only does she do fabulous interior design, but also specializes in kitchens and bathrooms. She is one of those background designers who really needs to shine more in the forefront, she's fantastic. (look at her portfolio). I realize that this was a very long post, and it should be even longer, as I can go on and on about the many nuances I have seen first hand in interior design in Arizona. For instance, I know of one "design firm" who is remodeling kitchens and bathrooms throughout Scottsdale, Chandler and Mesa and the owner was previously in an unrelated field with no experience nor knowledge of design WHATSOEVER! She continues to take advantage of unsuspecting homeowners by charming them, I suppose, because she continues to be hired without so much as a website and has left a bad taste in the mouths of dozens of homeowners that I know of for the last 9 months. The mistakes she's made and lack of knowledge for what she claims she can do has shown in her work. As much as I would like to publicize this business, I will continue to do my best to promote good design, educate homeowners on what to look for, and create amazing spaces for my own clients. But at least now, you are a bit more savvy on what to look for and avoid when selecting an interior designer in Arizona. If you appreciate my honesty on the subject, and are seeking a designer for your home, give me a chance to see if I may be a good fit for you and your home!